Sometimes when we say “simple”, we really mean it. Ripe tomatoes, a little onion, some olive oil (bacon fat, if you like), salt and pepper. And some time (mostly inactive). What do you get? 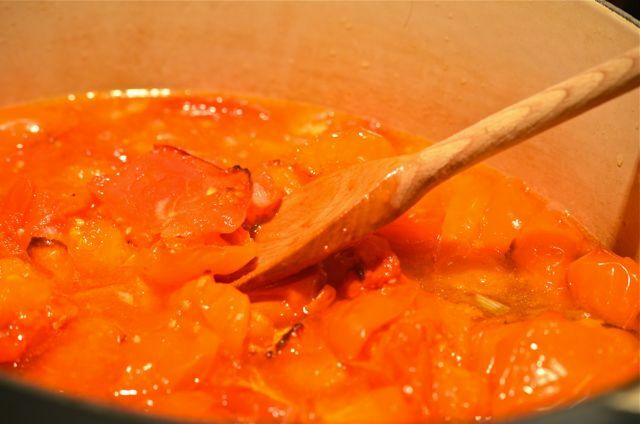 Sweet and tasty tomato sauce. And what about herbs and other seasonings? We’ll get there, bear with us…. 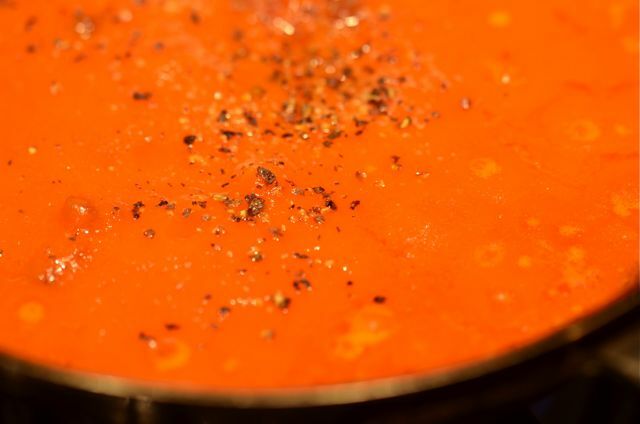 One of the keys for this sauce is taking the time to roast the tomatoes in the oven before you simmer them in the pot. The roasting caramelizes the tomatoes and adds more sweetness and complexity to the final sauce. The other key is using very ripe, even slightly overripe tomatoes- we just happen to have a bunch of our tomatoes and we need to use them. But many farmer’s markets will have late-season tomatoes, ask for their sweetest, ripe tomatoes. And go ahead and buy the ugly tomatoes- it’s all going into sauce anyway. Not necessary, but gets you a smooth texture. Making the sauce, as we noted, is easy. Roast the tomatoes (a lot of them). Meanwhile, add some olive oil and/or bacon fat to a big pot and sweat about half an onion. 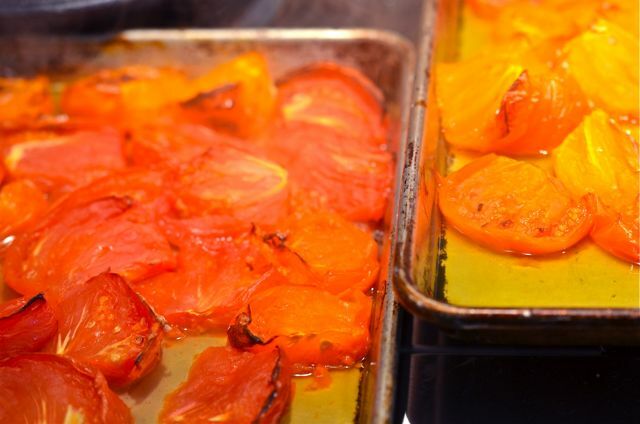 When the tomatoes roast and start to brown, remove them from the oven and add them (and any liquid) to the pot. Simmer at low heat for an hour, add a touch of water if the consistency gets too dry (don’t worry about dilution, plenty of flavor here). Season with salt and pepper, to taste. At this stage you have a choice. If you like a more “rustic” sauce with skins and seeds, just mash-up any large chunks with a wooden spoon and you’re done. If, like us, you like a smooth consistency there is a bit more work to do. We take an immersion blender to the sauce for a few seconds (a potato masher also works really well) and then strain the sauce through a mesh strainer to remove skins and seeds. We use a ladle to mash the sauce into the strainer to get as much sauce as we can. This sounds fussy, but it only takes 2-3 minutes and you do a get a smooth, glossy sauce. Your choice. Finally, how do we serve the sauce? This is where the sauce really shines. We use this sauce as a base and then do a quick cook with any other flavors we want to add, just before service. This time we browned a bit of home-cured bacon, added the sauce, a bit more pepper and a chiffonade of basil at the end. Yum. But a bit of garlic, thyme, oregano and olive oil would be great. Some Italian sausage? Excellent. You get the idea. So make this sauce and then add whatever you like, the sweet tomatoes are a great foundation to work from. Use any variety of sweet, ripe tomato you like. We used our orange Valencia and Purple Cherokee tomatoes. They were great. 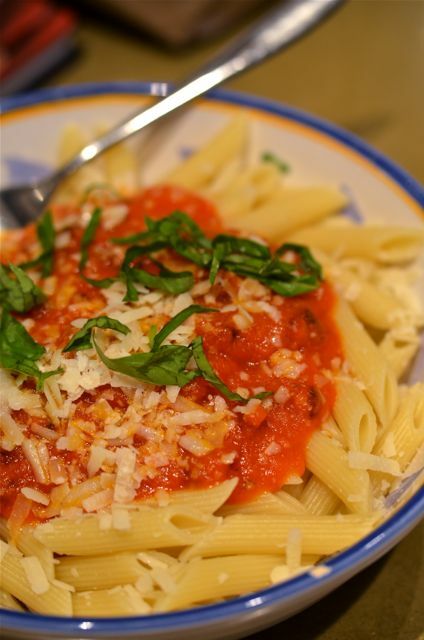 What You Get: Sweet, bright and flavorful tomato sauce. What You Need: No special equipment required, but the immersion blender is a good tool. A regular blender also works. How Long? About 2 hours, with 20 minutes active time. A fun weekend (or free weekday) project. Arrange the racks in your oven to fit a few baking sheets. Preheat the oven to 450 degrees. Half or quarter the tomatoes and place them on baking sheets, skin side down (grease the baking sheets with some olive oil to avoid sticking). 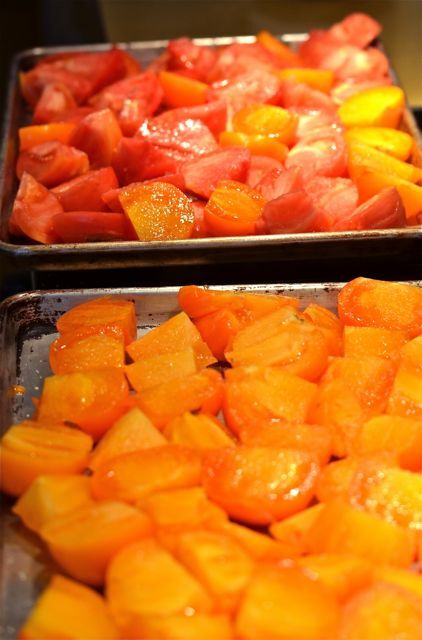 Place the baking sheets with the tomatoes in the oven and roast until the tomatoes start to brown on the edges, about 25-30 minutes. Meanwhile, place a large pot over medium heat. Add the olive oil and the onion. Cook the onion until soft, about 5 minutes. 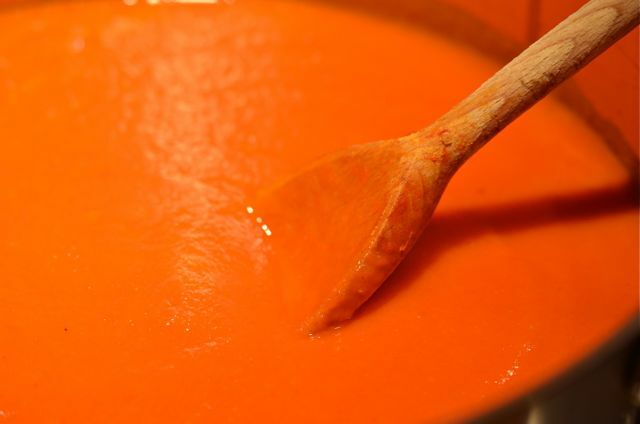 Using a blender or immersion blender, purée the sauce. 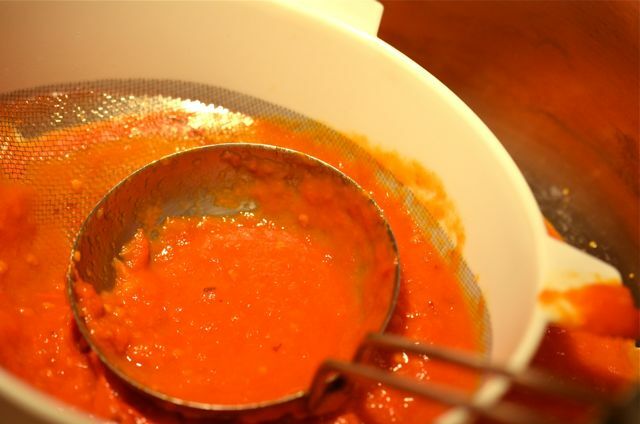 Then run the sauce through a fine mesh strainer or sieve. Use a ladle to push the sauce through the strainer. Serve or store in jars. The sauce will keep a week in the fridge. 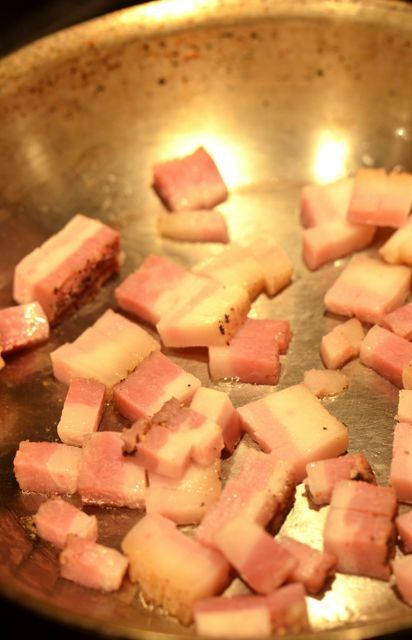 I coming over … I feel that smell over here – excellent recipe .. only a few ingredients and I love the bacon bits … even if it seams like you only use the fat *smile – goes on file. Good, I thought it was a bit strange that you only used the fat .. I would have kept in there too. Yummm. This does sound simple, but perfect! Wow and wow!! love this recipe! I think i could make my salsa like this also…and would roast the peppers and onions alongside the tomatoes. Usualy i char them on a griddle on top of the stove but this will save the messiness of that task. This is a tasty idea. I’ve been writing about my abundant tomato crop and need more ideas of how to use them up. This is perfect. Thanks! A little late for this season, but I just bookmarked it for next! I think I made 6 rounds of tomato sauce this year (including one made solely from all the Sweet 100s we couldn’t eat). BTW, just made the Calla Lily from the book/blog. Very good “light” cocktail…we may play with it a bit but we will use something similar for our holiday parties…thanks! 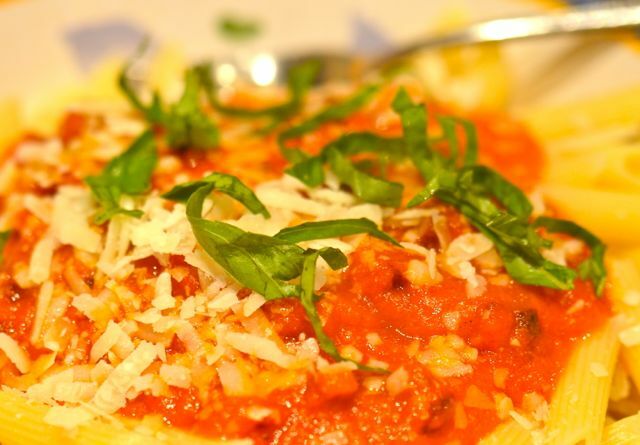 I take pride in my homemade pasta sauce but I’ve never tried roasting the tomatoes before hand….it looks sooooo good. I’m going to try it this weekend! Look at the color! I love using roasted tomatoes in my tomato sauce it makes it so intense and flavorful. Thanks for sharing – looks delicious! Thanks for the visit. We used some orange tomatoes with the red and purple and the color turned out pretty well…can’t complain. Hard to believe that’s all it takes to make a good sauce. I’ve been meaning to try making my own, but most recipes seem so daunting that I’ve been putting it off. This looks easy enough though! This one is easy, and good. 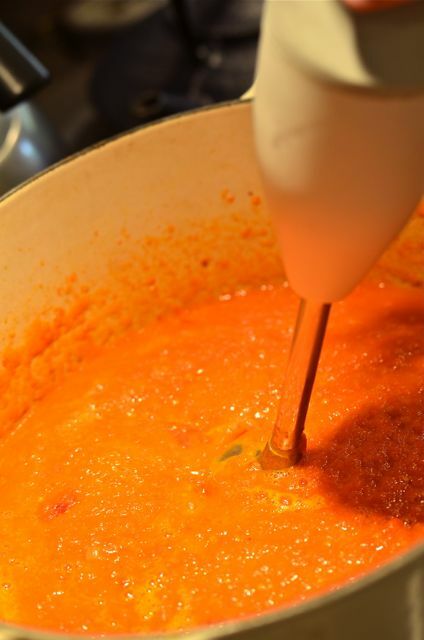 The other famously “easy” tomato sauce is Marcella Hazan’s “can of tomatoes, 1/2 an onion and a stick of butter” recipe. Google it, it is easy to find…and pretty good, particularly if using canned, rather than fresh, tomatoes. This looks delicious and I did something similar the other week with leftover bits of this ‘n that veggie and a whole lot of carrots. Oven-roasted with EVOO, S&P and then immersion-blendered them up. DH said, “too carroty”, but it was lovely to me! Sometimes simple is best, especially when you’re talking about something as delicious as fresh tomatoes. This is very similar to the tomato sauce I make for canning. I love being able to “customize” it when I open the jar by adding herbs and spices. Exactly! And we like to customize based on what other fresh ingredients are available….why just have one sauce, when you can have many? Totally agree about the cherry or slamler tomatoes. My annalise and yellow pear tomatoes are producing a ton of fruit, while the larger tomatoes require so much more work for such a small amount of fruit. I think I just might stick with salad tomatoes next year. Thanks for the tips on the suckers. I’m going to try not to by seed for the hybrids next year and over winter using this propagation method instead. Thanks! We will follow-up with a post! I tried your recipe yesterday and absolutely loved it. My only mistake was that I didn’t put olive oil on the roasting pan and pretty much ruined one pan with burned on tomato skins. My fault completely, and if I had looked more closely at your photos I would’ve seen the oil. I broke apart the roasted tomatoes on the pan and hoped the liquid would work to de-glaze the skin but it wasn’t a complete solution. I ended up with a nice sauce anyhow and I was impressed at how dense it was–not watery like just cooking down raw tomatoes. Roasting is a wonderful effect. Thanks! 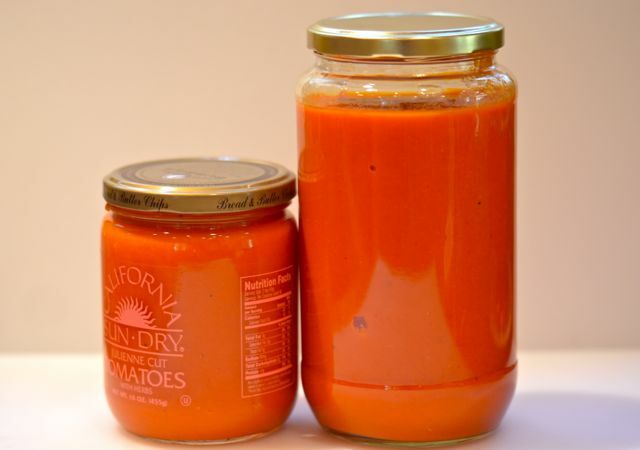 I made a small batch of this sauce on the weekend, using ripe, juicy tomatoes from my mother’s garden. it was heavenly! This is the best tomato sauce I’ve ever had. That is great! Thanks for letting us know!